From the Diapason collection, this glamorous set is composed of two Swarovski jewellery pieces. 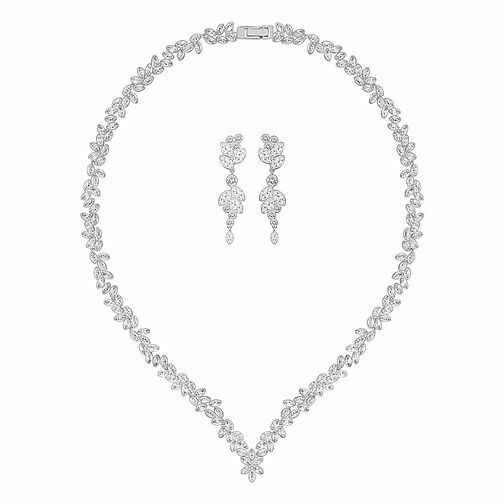 It includes the impressive pendant necklace, accompanied by a delicate pair of earrings. Both pieces are rhodium-plated and cut into petals for a feminine finish. Set with dazzling clear crystals. Swarovski Diapason crystal rhodium-plated set is rated 5.0 out of 5 by 2. Rated 5 out of 5 by Anonymous from beautiful beautiful piece of jewellery,not worn yet brought for my renewal of our wedding vows in October 2017.